In Windows 10, all notifications are displayed in the Notification center. Unlike the previous versions of Windows, apps don't need to have their own notification system. Apps can use the built-in notification center to display all kinds of notifications. As you can guess, the notification center makes it easy to keep track of and manage all notifications in one place. As good as the new notification system is, some apps show constant notifications distracting you from the actual work. This reduces your productivity. 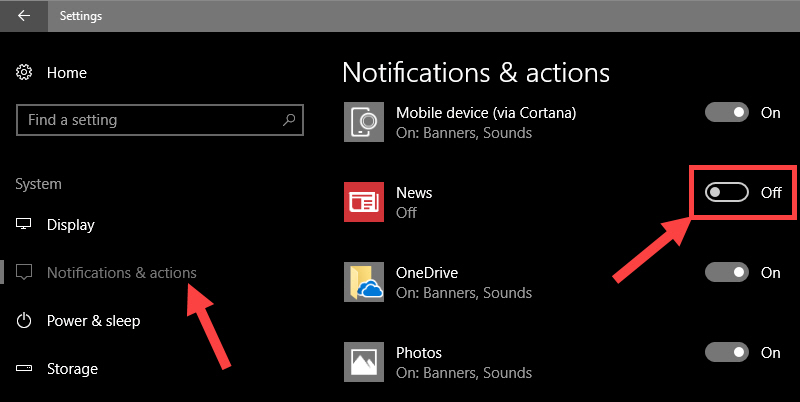 If that's the case, here is how to disable Windows 10 notifications completely. When it comes to disabling notifications, Windows 10 gives you a fair bit of control. For instance, you can either turn off notifications for specific apps or disable notifications entirely. i.e, for all apps either from the Settings app or via the Group Policy Editor. I will show all three methods. Use the one you need. Note: If you are looking to temporarily disable app notifications, you can enable Focus Assist. To turn on Focus Assist, click on the taskbar Notifications icon and click on the "Focus Assist" button. Focus Assist will automatically turn off itself after a few hours. To turn off manually, click on the button again. Turning off individual app notifications is useful when you have an app that is constantly showing notifications for unnecessary things like offers, events, etc. A good example of this type of behavior would be the gaming and social media apps. 1. To disable individual app notifications, open Settings app by pressing the keyboard shortcut Win + I. Alternatively, click on the Notifications icon and then click on the "Settings" button. 2. Go to "System -> Notifications and Actions" in the Settings app. 3. On the right panel, scroll down and you will see all the "Get notifications from these senders" section. This section lists all the apps that can show notifications. Here, toggle the switch next to an app to "Off" to disable notification access for that particular application. That is it. You've disabled Windows 10 notifications for that specific app. To enable notifications again for that app, toggle the switch to "On" and you are done. Disabling all Windows 10 notifications is useful when you don't want to be bothered with any app notifications whatsoever. 1. Just like before, open Settings using the shortcut Win + I. You can also search for it in the start menu. 2. In the Settings window, navigate to "System -> Notifications and Actions." 3. Toggle the switch under "Get notification from apps and other senders" to "Off". You will find the option under the Notifications section in the right panel. As soon as you turn off the setting, you will no longer receive any notifications either in the notification center or on the lock screen. To enable the notifications again, turn on "Get notification from apps and other senders." 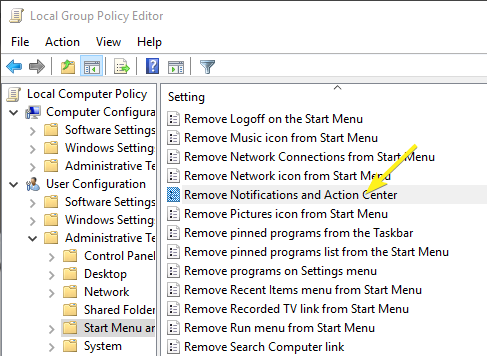 If you want to completely disable Windows 10 notifications the group policy editor is the way to go. This method is especially useful for system administrators or if have multiple computers to manage. 1. First off, search for "gpedit.msc" in the start menu and open Group Policy Editor. In the editor, go to "User Configuration -> Administrative Templates -> Start Menu and Taskbar". 2. On the right panel, find and double-click on the "Remove Notifications and Action Center" policy. In the policy settings window, select "Enabled" and click on the "Apply" and "Ok" button to save the changes. Do note that even when you turn off notifications or even notifications for individual apps, some apps can still show notifications. This is because these apps use their own notification system rather than using the one provided by Windows 10. You can see this type of behavior in applications like antivirus and firewall. In those cases, you have to disable notifications for that app by changing its settings.